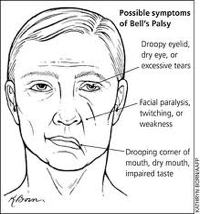 Bells Palsy is the most common cause of facial paralysis. It affects the facial nerve causing paralysis of muscles on one side of the face. This is thought to be caused by a viral inflammatory reaction to the facial nerve. The virus identified in most cases is the Herpes virus. The facial nerve travels through a bony canal in the skull and it is thought that the virus causes compression and swelling of the nerve. As the nerve becomes damaged it is unable to transmit nerve impulses. As a consequence the muscles it supplies, weaken or become paralysed. Facial paralysis can come on very suddenly i.e. overnight and can therefore be very traumatic. Bells Palsy occurs equally in both sexes and at any age although incidence increases with age. It occurs in 10-40 / 100,000 of the population. Over 80% of people with Bells Palsy naturally make a full recovery. However for the remaining 20% non-recovery can often be devastating. Fortunately management of Bells Palsy has improved considerably with Physiotherapy now playing a key role. Paralysis of the muscles controlling facial expression (e.g. smile, surprise, frown, pout and eye closure). Altered sensation on the side of the face affected. Tightness of the facial muscles. Early intervention is recommended and management consists of both medical intervention and rehabilitation. An MRI maybe ordered to eliminate other possible causes. Oral steroids are recommended to reduce swelling around the nerve. These should be started as soon as possible preferably within 48 hours to be most effective. Anti viral medication is also used however the benefits remain controversial. Not everyone will require all of these interventions so skilled assessment by a specialised chartered Physiotherapist is essential. EMG/ biofeedback are valuable tools give feedback on the progress and recovery of the nerve. The key to achieving normal muscle activity is to specifically teach the muscles to work independently as they did before. It is important that objective markers are taken during the initial assessment and throughout the rehabilitation progress so that you can see the changes taking place. Whilst most Bells Palsies recover completely unfortunately some cases weakness persists. If this should happen then there is the possibility of developing synkinesis. 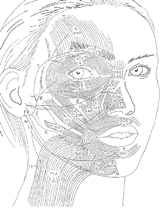 Synkinesis is mass movement or involuntary movement of the facial muscles. For example when attempting to smile the eye may narrow or when closing the eye the mouth pulls up. It usually becomes apparent around the sixth-month post palsy but can occur much earlier. It will develop where there is ongoing facial weakness and can vary from being subtle to quite marked. Unfortunately it can be embarrassing interfering with appropriate facial expression. Physiotherapy intervention can specifically address this distressing symptom. Of importance is to identify the symptom early, address it and monitor closely. At the Dublin Physiotherapy Clinic we run a Facial Rehabilitation Clinic providing assessment, treatment and monitoring through the various stages of recovery. Please feel free to call us to schedule an appointment, get advice as to whether physiotherapy is appropriate for you or to clarify any points of concern.